All-in-one design and cast aluminum body for maximum durability and sleek appearance. Powerful processor that delivers blazingly fast speed and flawless performance. Massive storage to support even the largest inventories as well as extensive reporting data. 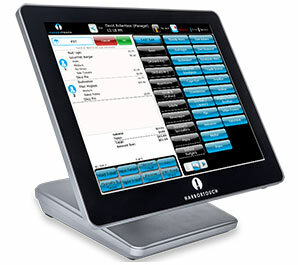 Choose the package that's best suited for your business, and build your free* POS system today! This software package offers a wide range of advanced retail features such as a color/size/style matrix, inventory tracking, customer database, vendor management, purchase order creation and even support for rentals and consignment. A robust restaurant software ideal for fine and casual dining as well as quick service establishments. Features include efficient order management, flexible pricing for discounts and specials, easy menu set-up, employee management and table tracking. A retail package developed specifically for convenience stores, with advanced vendor and inventory management functions. Perfect for quick service and delivery restaurants such as pizzerias, this software has many of the features of our hospitality package but is specially designed to include a more dynamic customer database and caller ID integration as well as printable driving directions for the delivery person. A custom solution for beer, wine and liquor stores, this software meets the unique needs of this market with features such as age verification.